This article sets out the three requirements that must be satisfied to vary the vesting date and thereby extend the life of a discretionary trust. The first and most obvious of these is that the vesting date must not yet have arrived. The second requirement is that the trust’s vesting date must be capable of variation, by the trustee, the collective agreement of the beneficiaries (under the rule in Saunders v Vautier), or by the court. The final requirement is that the extension of time must comply with the trust’s perpetuity period (which will depend on the drafting of the trust and the legislation presiding over it). Having examined these requirements, the capital gains tax consequences of any change to a trust’s vesting date are considered. Prior to the foundation of permanent law reform bodies in the second half of the 20th century, the process of statutory law reform of private law in Australian jurisdictions was a largely unseen exercise. 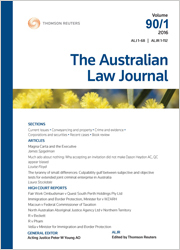 Drawing on archival sources, this article explores the role that members of the legal profession played “behind the scenes” in the creation of one of the most radical law reforms in private law in New South Wales in the first half of the 20th century, the extension of liability for negligently-caused nervous shock. Members of the profession both agitated for reform and provided suggestions for change and in doing so they demonstrated a willingness to depart from developments in England thought inappropriate and a determination to create a solution which would place New South Wales at the forefront of the best modern legal developments. The current operation of the family law system continues to be a source of great dissatisfaction to almost everyone caught up in it. There are many reforms that could ensure that the system works better within the existing budgetary envelope. These include better gatekeeping strategies to ensure that people have made efforts to resolve their disputes, or to narrow the issues, before filing; listing priority to be given to parties who have taken all reasonable steps to resolve their dispute; obligations on practitioners and judges similar to those contained in the Federal Court of Australia Act 1976 (Cth) to facilitate the just, quick and cheap resolution of the real issues; the greater use of costs orders against people who pursue unreasonable or unnecessary applications or responses to applications; and legislative provisions to deter unethical lawyering. Finally, the article explains the rationale for the pilot of Parenting Management Hearings for self-represented litigants. For the PDF version of the table of contents, click here: ALJ Vol 92 No 6 Contents.